9. ISCAP Services 9.1. Library 9.2. Medical Office 9.3. Students’ Union 9.4. Information Services Room 9.5. Photocopy and printing facilities 9.6. Computing Helpdesk 9.7. GAIE - Support Office for Innovation and Education 9.8. Marketing Digital Group — NMD 9.9. Managerial Simulation — SE 9.10. Cafeteria 9.11. Snack-bar and Coffee-shop 9.12. Bank 10. Thank you for choosing ISCAP! We very much hope that while you are here you will not only acquire new skills and knowledge, but also enjoy your new life in an exciting environment. Over the years, ISCAP has considerably extended its international network and has developed exchange programs with various partners in Europe. The number of outgoing and incoming students and lecturers has increased significantly over the years. Besides, the annual International Week has contributed to the â&#x20AC;&#x153;Internationalization at Homeâ&#x20AC;? process and the establishment of enduring academic and scientific bonds amongst lecturers and researchers. At ISCAP, we take both the academic and personal needs of our exchange students and lecturers very seriously, and we continually strive to provide you with a dynamic and stimulating teaching and learning environment. The International Office staff will ensure that your time at ISCAP is spent wisely. It is our commitment to provide you with any assistance you may require. For quite some time now, ISCAP has been developing successful international relations with a large number of institutions from several countries, not only in Europe, but worldwide. This has allowed us to carry a structured internationalization strategy, resulting in ISCAP being one of the most international Schools of Polytechnic of Porto (P.PORTO). 2.1. 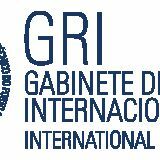 ISCAP International Office (GRI) The International Office is a service directly dependent on the Dean, and associated with GCRI (Central International Office), whose mission is the internationalization of ISCAP and its community. 3.2. What to do upon arrival Please contact the International Office of ISCAP (GRI) or COMAP - Buddies Commitee - or your Buddy if you already have his/her contact. 3.3. Support to Exchange Students 3.3.1. Tutoring During your mobility, ISCAP will assign you a tutor teacher and COMAP - International Studentsâ&#x20AC;&#x2122; Committee - will also assign you a buddy. The tutor teacher will help you with the learning agreement and schedule and contact with other lecturers. The buddy will help you to adapt to the school, the city and the whole student environment. 3.3.2. Language and culture ISCAP offers each semester a Portuguese Language and Culture Course in order to help you acquire the basics of communication skills in Portuguese. 3.3.3 Accommodation and Wellbeing International Office counts on the assistance of COMAP to manage an online database with several accommodation offers. Just visit COMAP website at www.comap-portugal.com and book the accommodation offer that best suits you. 4. Brief introduction to ISCAP ISCAP – School of Accounting and Administration of Porto – has its origin in the Decree-Law no. 327/76, of May 6, although its historical roots can be traced well before that date. In fact, it was in 1886 that the Industrial and Commercial School of Porto was established (Decree-Law of December 30, 1886) by Minister Emídio Navarro who laid the basis of the industrial and commercial teaching in the country. This institution holds memories from different generations as well as life experiences and memorable partnerships. This distinguishing mark of quality teaching can be observed in the programs of the courses here offered. The Porto Accounting and Business School (ISCAP) belongs to one of Portugal’s largest and most prestigious public Polytechnic Institutes, the Polytechnic Institute of Porto (P.PORTO). Located in S. Mamede de Infesta (Matosinhos), very close to IPP Campus, it offers its 4,000-strong student population a range of innovative under programs in Accounting, International Commerce, Marketing, Business Communication, Administrative Assistance and Translation, Creativity and Business Innovations, Human Resources and Library and Information Sciences and Technologies. Moreover, ISCAP offers master programs in Specialized Translation and Interpretating, Accounting and Finance, Auditing, Entrepreneurship and Internationalization, Organizational Management, Logistics, Administrative Assistance, Digital Marketing, Business Information, Human Resources, Finance and Intercultural Studies for Business. Before the beginning of each semester, COMAP together with ISCAP International Office organize an Orientation Week. We expect that this event can help you adapt better your new context. You will be informed of the exact period in the Acceptance Letter. * See note on page 13. Notes: 1.These courses will be taught in English. 2.You can choose other foreign languages (French, German, Spanish*, Russian). Please see the list at our website. inform the institution of origin if the student is accepted (max. of 10 students, first come, first served). If accepted, the student is to deliver a 30-page project (or a similar assignment, according to the supervisorâ&#x20AC;&#x2122;s instructions), supervised by a lecturer of the field of study. *If you have already at least a B1 level. * See note on page 16. Notes: 1.These courses will be taught in English. 2.You can choose other foreign languages (French, German, Spanish*, Russian). Please see the list at our website. 3. 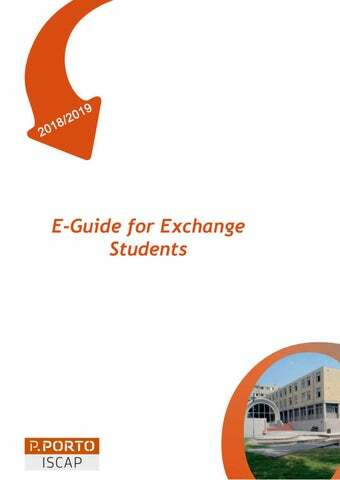 Enrolment in the course “Project” will only be available if the course required is not available in the Exchange Program and it is compulsory in the home institution. The international student’s Coordinator must send us a letter stating that the student needs to develop a project in a specific course, a syllabus and the application forms. ISCAP will then check if a supervisor is available for the required course and inform the institution of origin if the student is accepted (max. of 10 students, first come, first served). If accepted, the student is to deliver a 30-page project (or a similar assignment, according to the supervisor’s instructions), supervised by a lecturer of the field of study. As a student in ISCAP you will have to adapt to the new learning / teaching environment and to attendance and assessment procedures. Upon arrival, you will be given detailed information, in the Welcome Kit, on class attendance, assessment methods and examination procedures. Please read it carefully, donâ&#x20AC;&#x2122;t forget to meet the deadlines and check the current Academic Calendar for further details. The fastest way to get to ISCAP is by Metro. The Porto Metro has six lines, each individually identified by a different color and an alphabet letter. Every line intersects the Trindade station. The one that takes you to ISCAP is the Yellow one (line D), taking the Hospital de S. João direction. Depending on where you are coming from, you may need to transfer to that line, in that same station. The metro station closest to ISCAP is precisely the last one, “Hospital de S. João”. From there, you can go on foot or take a bus to ISCAP. 9.1. Library (3rd Floor) The Libraryâ&#x20AC;&#x2122;s facilities are spacious, and its purpose is to encourage research and study. The Library also includes a reading room with newspapers and magazines. The books on display cover such diverse areas as Administrative Assistance, Communication, Accounting, Law, Management, Languages, Computer Science, Mathematics and Statistics, Marketing, Social Sciences, and Economics. Audiovisual material, such as CDâ&#x20AC;&#x2122;s, DVD, Movies, Television series, etc, can also be consulted. The reading Room closes its services 15 minutes earlier. Books/domiciliary loan books must be returned 15 minutes before closure. Important Notice: All books and other library materials must be returned within the deadline. Otherwise, you will be charged a daily fee and your Transcript of Records cannot be issued until this situation is solved. Requirements: Permission only to login and print. Typing assignments is not allowed. Students must use their own paper. 9.7. GAIE - Support Office for Innovation in Education GAIEâ&#x20AC;&#x2122;s (Support Office for Innovation in Education) mission is to foster the connection between the pedagogical needs existing in higher education and an efficient use of technology in education. GAIE also intends to ensure consulting services as well as a support system for teachers and students that will be enabled through the development of training opportunities, support resources in educational technologies, conception and transformation of pedagogical contents and the dissemination of best practices, methodologies and applications. 9.8. Marketing Digital Group â&#x20AC;&#x201D; NDM The Multimedia Marketing Lab (SMM) is dedicated to teaching and research in the Marketing field. Rooms 024 and 209 are equipped with state-of-the-art technology, both in terms of software and hardware. Whenever vacant, the rooms are open to Marketing students and teachers, allowing them to develop curricular and extra-curricular activities. For more information, go to office 339. 9.9. Managerial Simulation â&#x20AC;&#x201D; SE The courses of Managerial Simulation (SE) were brought into the program of Accounting and Administration, at ISCAP, in the Summer semester of the school year 2003-2004. Besides exempting students from the internship required to access the Chamber of Chartered Accountants, this course aims to create a demanding, complex, universal and technologically advanced business environment, without the risk inherent to the real business world. In this controlled environment, companies are comprised of 3 or 4 student elements who, through business management information systems, establish commercial and institutional relations with several organizations. These companies operate in very diverse areas, ranging from food products wholesaling to shoe producing and retailing. The studentsâ&#x20AC;&#x2122; main objective is to manage their companies at every level, to complete an available plan of costs and profits. Going beyond traditional assessment methods, student evaluation relies on available technology and teachersâ&#x20AC;&#x2122; dedication. Students are assessed both individually and as a group. 9.11. Snack-Bar and Coffee Shop (Floor 0) There are also 3 coffee-shops in ISCAP for light meals and snacks. The ones in Buildings C and D serve menus at lunch and dinner for around 3,5 €. They are open from 08:00 to 22:00 during classes periods and from 09:00 to 17:00 on holidays and exam periods. Close to the school you will also find several restaurants, serving lunches and dinners for around 5 €. 9.12. Bank Since the beginning of the school year 2004/2005, ISCAP provides its students with banking facilities in its own premises, in room 119. These offer students the possibility of opening and managing several types of bank accounts. Advantages are also available for the Students who can open a bank account and ask for a debit card, necessary to their stay in Portugal. Opening Hours: Monday and Wednesday from 8:30 to 12:00. Tuesday and Thursday from 13:00 to 18:00. 10. Cultural Activities in ISCAP 10.1. Orientation Week Before the beginning of each semester, COMAP together with ISCAP International Office organize an Orientation Week. We expect that this event can help you adapt better your new context. During nearly a week, you can participate in several activities in and outside the school together with other Exchange Students and the buddies. 10.2. Cultures on the Move This is mainly an event organized for ISCAP Students. However, your participation plays a very important role! You will be invited to do a presentation on your country, culture and institution, together with your national colleagues. More detailed information will be provided during the semester by ISCAP International Office and your Business English teacher. 10.3. International Week ISCAP organizes every year an International Week, welcoming a great number of visiting lecturers. Moreover, we also organize various activities for all the school. We count on your cooperation and participation! 11. Living in Porto 11.1. About the city The North’s well-known capital, Porto is Portugal’s second largest city and a thriving industrial centre, successfully blending commercial tradition with an atmosphere of unpretentious charm and casual sophistication. Rich from centuries of trade, modern Porto is as much a cosmopolitan centre as it is a city steeped in the historical events of the past. Magnificently situated on the great gorge of the River Douro, the city is best known for its striking bridges and the much-celebrated Port Wine. Classified as a UNESCO World Heritage Site in December 1996, the ancient Ribeira riverside district is a maze of narrow, twisting streets and shadowy arches. The ongoing restoration of this lively quarter is attracting a growing number of restaurants, bars (specially the Galerias de Paris area) and discos (namely in the Industrial Area). Crossing the spectacular two tiered Dom Luís bridge brings you to Vila Nova de Gaia, the true home of Port Wine, where visitors can tour the world famous cellars. We also recommend that you visit the city’s various gardens and museums, particularly the magnificent City Park and the Serralves Museum of Contemporary Art. 11.2. The weather The weather in Porto is typical of Atlantic regions: damp but temperate, with colder nights. In winter, it may rain quite a lot, but it never snows, as temperatures never fall below 0 ºC. In summer, temperatures rise and the warmest months are June, July and August, when temperatures vary between 20 ºC and 35 ºC. September, October, April and May are intermediate, with periods of atmospheric instability: quite frequently foggy mornings are replaced by sunny afternoons, or rain showers alternate with periods of bright sunshine. You are therefore advised to bring some warm clothes for the colder days. 11.4. Places to visit Porto has one of the richest artistic, cultural and historical heritages in Portugal internationally recognized by UNESCO, which classified the ancient part of the city as World Heritage. Porto has also been chosen as a European Capital of Culture in 2001 and is proud of its vast number of churches, monuments and museums that were very important in the historical development of the city and even of the country. February/March - Fantasporto Porto International Film Festival - Considered by the professional international magazine â&#x20AC;&#x153;Varietyâ&#x20AC;? as one of the top 60 movies festivals in the world, and the best as far as the fantasy genre is considered, Fantasporto has become the most famous film and cultural event in Portugal. May (First Week) - “Queima das Fitas” (Academic Week: Symbolic burning of the school ribbons) It’s an event involving more than 450,000 students, lots of music, drinking and merry-making through the streets and in the “Queimódromo” (where the concerts and parties take place). May (Last Week)/June (First Week) - Serralves em Festa Every year, for a 40-hours-non-stop-extravaganza, the Museum opens up for visitors, with all sorts of exhibitions, concerts and shows. All for free. June – Festivities of Saint John June 24 is Porto’s biggest annual festival, honoring the city’s patron, Saint John. Although Festivities of Saint John are held in many other towns, it is in Porto that they are most colorful. They are held at least since the XIV century and have expanded greatly since the XIX century. Nowadays, in the night of 23, at every corner of the city there are “cascatas” (religious motifs), bonfires and groups of merry-makers singing and dancing all night (and whacking each other in the head with plastic hammers). Most events are held at the Fair of Fontainhas. July - “Francesinha” festival Francesinha is a specialty made with slices of bread, melted cheese, different kinds of pork meat and a special secret sauce. Note: You should always carry your Passport or ID Card (or at least a copy of them). Useful information about ISCAP-P.PORTO for visiting students and faculty members.